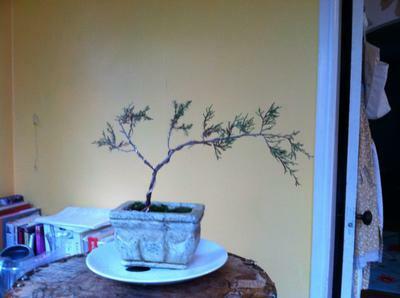 I found this Juniper in a rock crevasse and decided to make a Bonsai out of it. I destroyed the roots getting it out and kept it in water on the drive home. I repotted it for a couple weeks in it's original soil and it came back to better than when I first found it. Now I have put it into its first pot, wired it and trimmed it back to how I think it should look. How do you think it looks? Any pointers?